1ft expandable solid pipe with universal male end adapter can be used as a flexible downspout adapter when connected to a Twist & Seal 2x3 or 3x4 Downspout fitting. You can also create a flexible and universal drain cap unit when connected to part#1005DC-FTR. 12ft expandable perforated pipe can easily bend and work around any outdoor obstacles. Is perfect for groundwater drainage such as French drain systems. To prevent clogging of the slots, this pipe should be used with a surrounding base of gravel or rock. 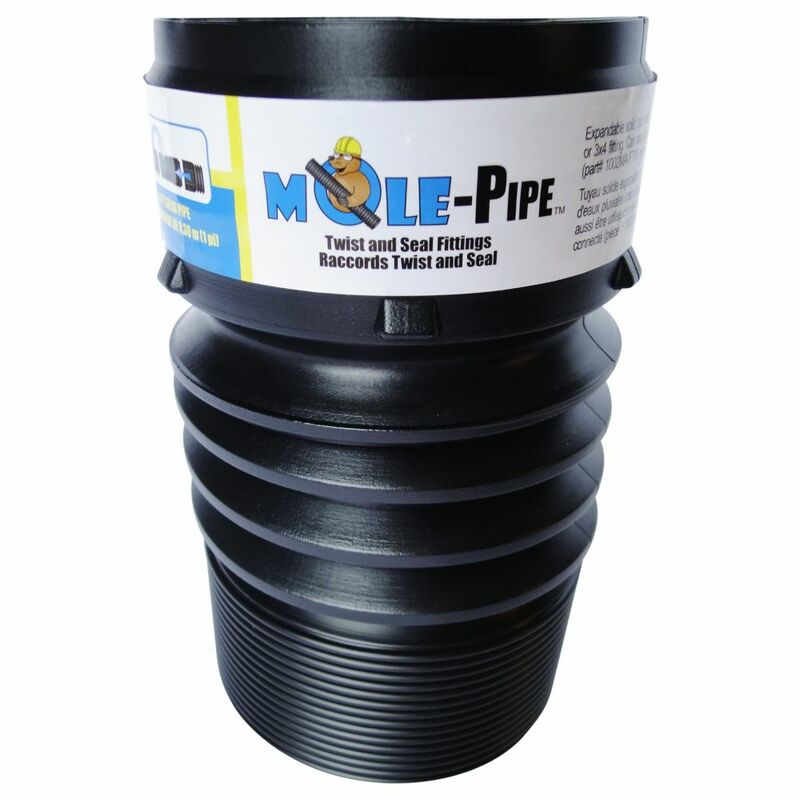 MOLE-Pipe lengths are approved for above and/or below ground applications. 12ft expandable solid pipe can easily bend and work around any outdoor obstacles. It is perfect for diverting water from one point to another and is approved for above and/or below ground applications. 20ft expandable Slotted with Sock pipe can easily bend and work around any outdoor obstacles. Is perfect for groundwater drainage such as French drain systems. Polyester sock prevents clogging of the slots to allow use in areas where soil or sand requires filtration. MOLE-Pipe lengths are approved for above and/or below ground applications. 8ft expandable solid pipe can easily bend and work around any outdoor obstacles. It is perfect for diverting water from one point to another. MOLE-Pipe lengths are approved for above and/or below ground applications. 1 Feet Expandable Solid Pipe 1ft expandable solid pipe with universal male end adapter can be used as a flexible downspout adapter when connected to a Twist & Seal 2x3 or 3x4 Downspout fitting. You can also create a flexible and universal drain cap unit when connected to part#1005DC-FTR.